No Credit needed!!. Move In Today!! 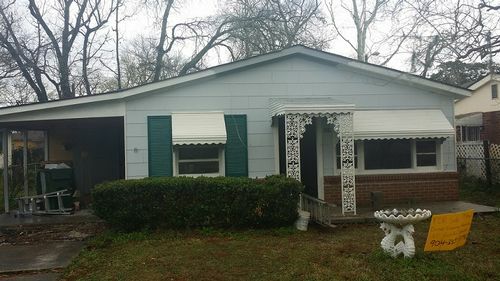 Charming "Starter" home located in Carver Villiage. This 3 Bdrm 1 Ba directly across the street from your neighboorhood park, with tennis courts. only minutes away from Downtown, Shopping, and Dining. Don't pass this quaint home up, with a price tag like this it wont last long! This home been completely renovated with ne kitchen and new bathroom, new paint throughout entire interior and exterior. in order to view the home or before you call us to answer questions. Fill out the Pre-Qualification Application. Payments Starting between $625.00-$775.00/Month Plus Downpayment. ** 3 BDRM 1 BA fenced back yard, CH/A & Air with Washer Dryer connections. PLEASE READ- ALL INFORMATION REGARDING SHOWING AND QUALIFICATIONS ARE BELOW. Thank you for your inquiry- I would like to make sure that you are aware that this is a lease option property. (Which means you have an option to purchase property, if you do not want to purchase the property your Option Fee will be nonrefundable). Our viewing times are between 8am and 6:00pm. We show on lockbox/codebox. You will need to text over a copy of your driver's license to verify identity before code is texted to you. We do not give out code until you are at the property. Our codes change every 20 minutes that's why we require you to be at home before code is given to you. When you arrive at home you will have to send us a picture of yourself in front of home so we can verify your ID with the picture on your driver's license.